LetStart Admin is a full featured, multipurpose, premium bootstrap admin template built with Bootstrap 4 Framework, HTML5, CSS and JQuery. 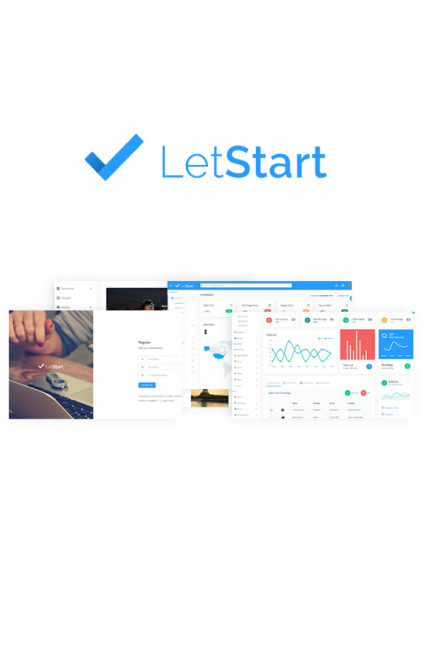 LetStart is one of the best admin panel templates. With this bootstrap admin template, you can quick start your project. Why waste time starting from scratch; try out our admin dashboard template. LetStart is crafted based on google material design so that you can be assured that your application follows the best practices in usability and performance. LetStart bootstrap admin template follows flat design guidelines which make it sleek, clean, intuitive and user-friendly. Once you purchase LetStart admin panel template, you will be entitled to free download of all future updates. We appriciate your valuable feedback. My product comes with an extensive help file to help you understand how it works. If you encounter any problems or have questions once you purchased the theme feel free to contact me. Reply times can be up to 24 / 72 hours Monday to Sunday. Please be patient when posting an issue as i work (IST+00:00) time zone.